BAGHDAD, Iraq (CNN) -- Protesters across Iraq Tuesday urged government authorities to free the TV correspondent who threw his shoes at President Bush. Hundreds of students at Diyala University in Baquba carried banners demanding the release of Muntadhar al-Zaidi -- described by demonstrators as an "honorable Iraqi." Smaller protests emerged in the Anbar province city of Falluja and in two Baghdad locations -- Baghdad University in the northern part of the city and western Baghdad's Ameriya district. In those events, students also took to the streets. Al-Zaidi threw his shoes at Bush, while Bush and Prime Minister Nuri al-Maliki were holding a Sunday news conference after the president's surprise visit to Baghdad. The journalist was dragged to the ground, hustled out of the room and arrested. 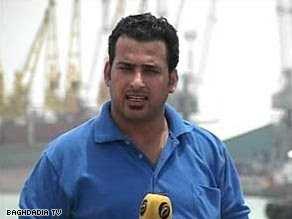 Dhirgham al-Zaidi, the shoe-thrower's brother, said the journalist hated the "material American occupation" and Iranian influence in Iraq. TV networks across the world continue to air the shoe-throwing scene, which has touched a nerve in the Arab world, where there has been an outpouring of support for al-Zaidi -- a correspondent for the Egyptian-based Al-Baghdadia TV. Its crawls include messages of support from Iraqis and foreigners. Iraqis have been receiving short text messages of support on their cell phones, and some of the notes are short poems.